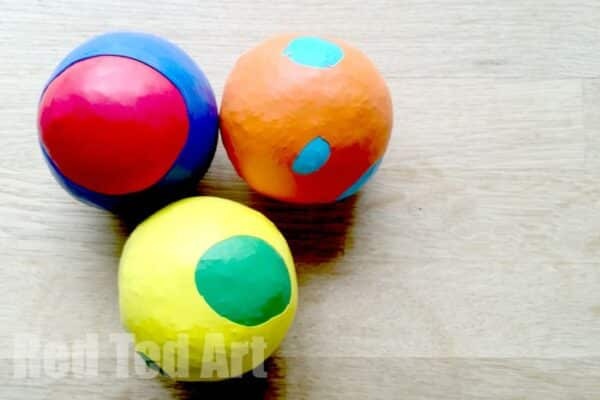 UPDATE: I love the suggestion in the comments to fill these with sand as an alternative filling for stress balls! 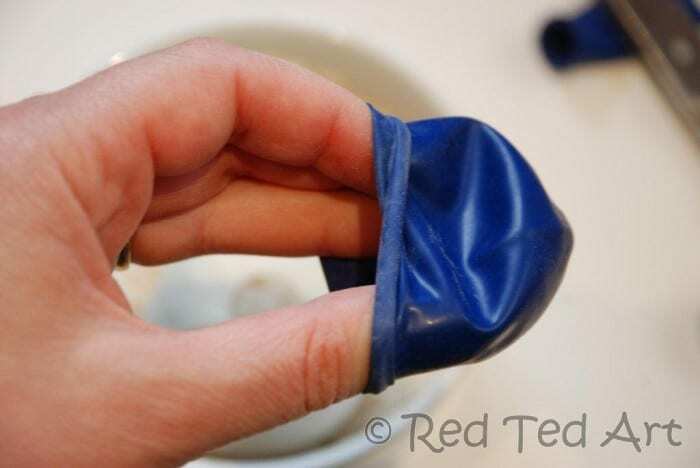 1) Snip the end of one the balloon – the one you intend on having in the centre. We filled the white one first and kept the dark blue one for the head. In retrospect, as we drew faces on with marker pens, I would reverse the colours – our faces don’t show up very well on the dark blue. 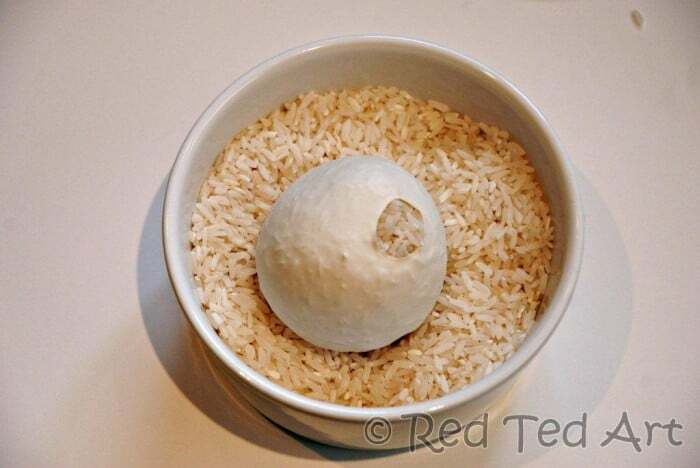 2) Fill you balloon with rice. This was a bit fiddly and messy.. 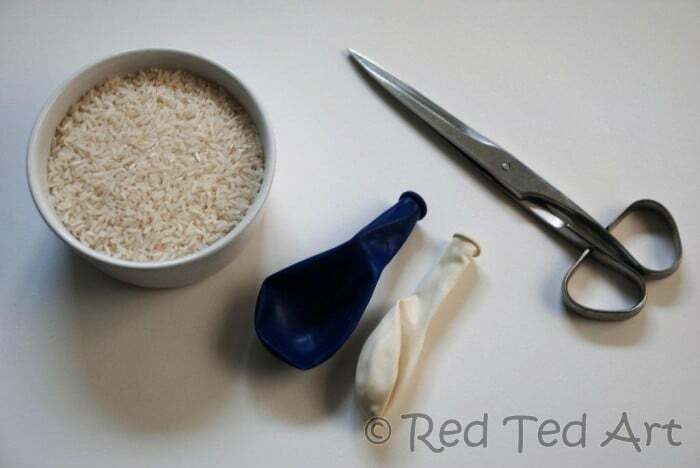 I held the balloon open, whilst Red Ted scooped in the rice with a spoon. As it got fuller, I squished the rice down as he filled. Tricky. I had a look online if there was a clever way of doing it.. and low and below there is: see Tip Junkie’s top tip of filling your rice in a small sandwich bag first! Ha. Clever. It works… but if you don’t have any sandwich bags… then stuffing it with a spoon and fingers works too. 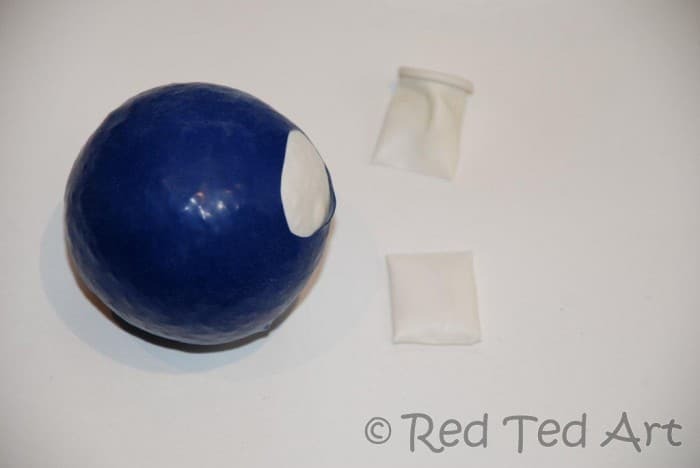 3) Cut the top off your second balloon and stretch over the rice filled balloon – making sure you cover the hole to keep the rice in. Try not to create any are bubbles. 4) Using the “snipped off bit” – cut a piece off – approx 2cm or an inch. 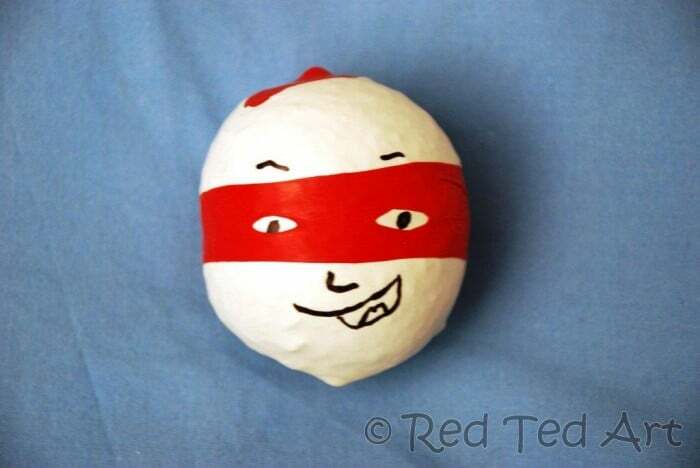 Then stretch it over your ball to make a mask. Using nail scissors or a needle, carefuly poke some eyes in mask. Take care not to damage the juggling ball. The majority were easy enough to do. 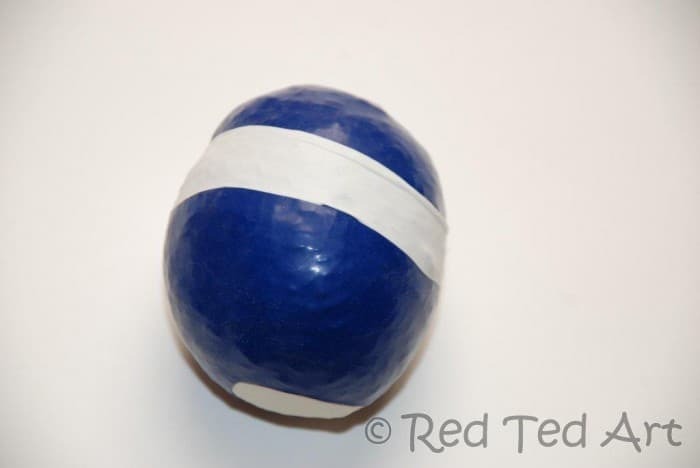 But for some reason on the blue ball with the white mask, the white kept splitting and splitting and splitting… mmmh. 5) Draw on your face with a ball. Isn’t my neighbour’s son simply too clever? Go him! Now juggle or play. My kids decided that they were not interested in juggling, but throwing. Fine. Which did mean that half the masks ended up coming off. But the faces are still there and intact and look good. So all is well! 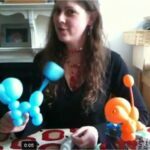 How to… make a Balloon Poodle! 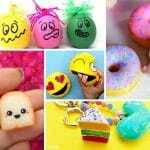 I love your squeeze ball craft. I used to work with children with special needs, and we used these with the children to help them calm down. Once upon a time I made one with sand, and it was completely gratifying and affordable, not to mention useful for when children need to “take a breather”. 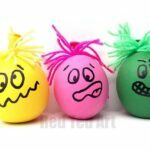 I now work with typically developing children, and I think the squeeze ball serves as an incredible tool for when they need to take a break. thank you for this tutorial. I think it is a valuable little tool for teachers and parents alike! I love your spin on it…I always enjoy your posts! Those superhero masks are awesome!! What a great idea. They would make good fathers day presents too if I can remember for the next year. @Carolyn yes of course – I forgot that they double up as stress balls!!! Very good point (in fact, we have been kneading them a lot here!) Have added the point about the sand! Thank you. And thanks for the kind comments everyone! @Cerys yes, it was a little fiddly… though they DO love PLAYING with them! These are so cute! 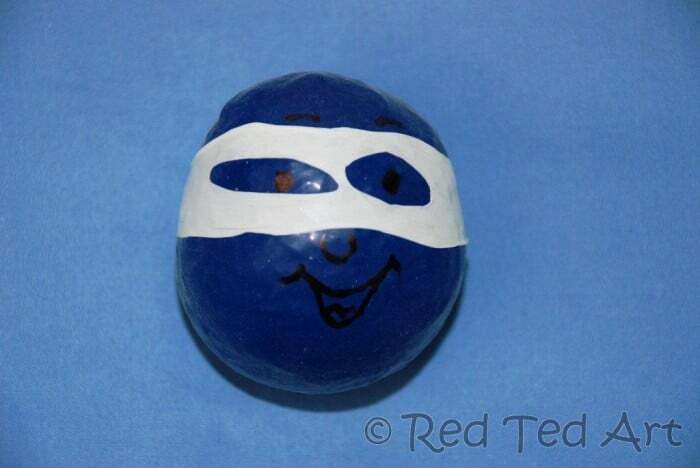 I love these masked balls! 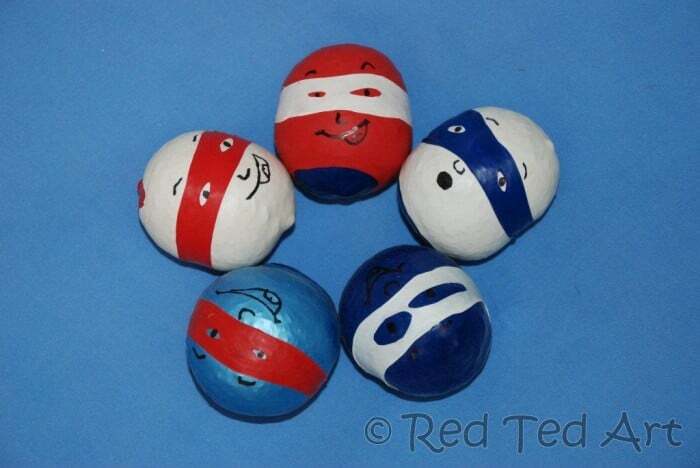 I love the idea of making the balls into superheroes!! 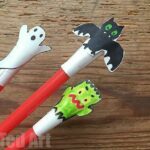 Just posted on Craft Gossip! Your juggling balls are adorable! Oooh Kirsten, thank you SO much! Super cool, again. 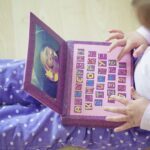 You only have unexpected items on your blog. I love this. Thank you for linking it up also at our linky party, http://www.finecraftguild.com/party . 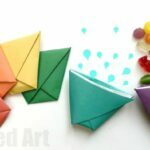 Tomorrow a new party opens up, so I am inviting you to come again with more great inspirational ideas/project tutorials. Oh my Maggy these are fabulous! Love the faces!!! Might have to make some of these for my daughter. SHe would get a kick out of them! Thanks for sharing at The Sunday Showcase. 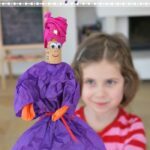 Great fun to make, my kids love them. Also great to fill with cornflour as it makes a great noise when squished (sort of crunchy fart!) keeps the kids in giggles even at the age of 13 and 15! Oooh what a great top tip! My kids will LOVE that too! 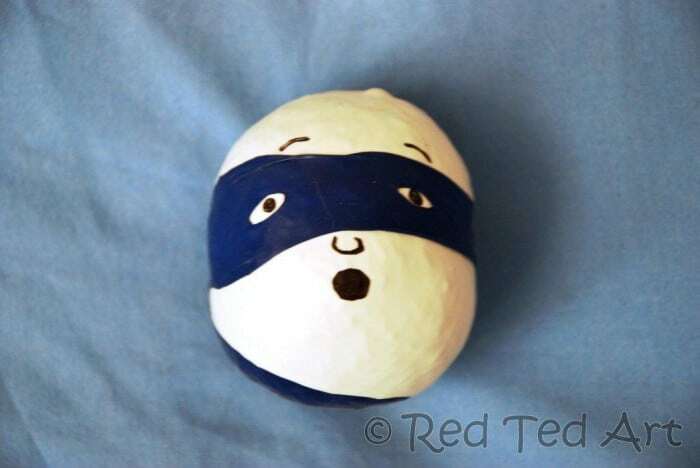 Love making stress balls… I often make them with FLOUR. 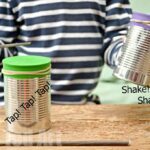 An easy way to fill is to use a soda bottle top as a funnel and do not cut the top of the balloon off. stretch the opening of the balloon over the top of the soda bottle and use this as a funnel. 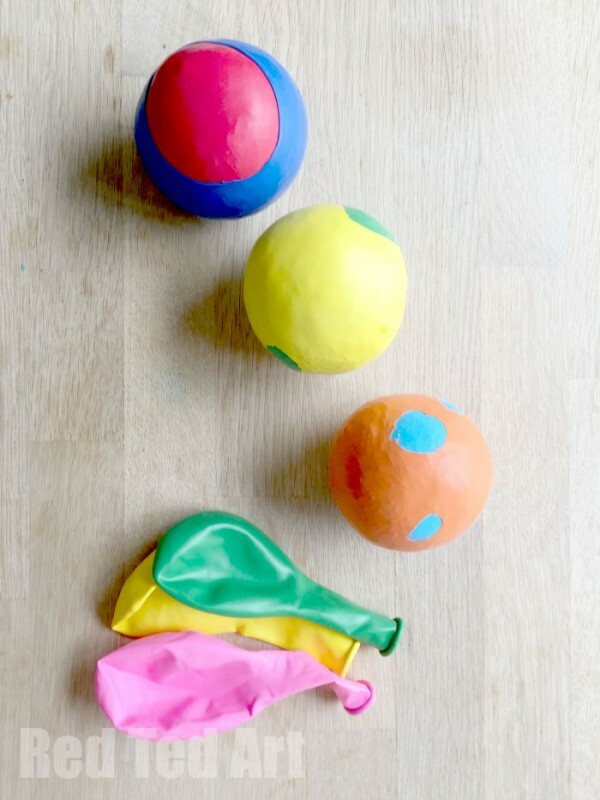 Because of all of the air in flour and the stretch of the balloon, you can compress the flour/ stretch the balloon to add more. We also use a chopstick or something similar to help poke the flour in. I always double my balloons before filling as well!